Ok I will soon be putting the F-2 on my motor and it is cog belt driven. At what boost do I need to be concerned about the strength of the crank snout and breakage? 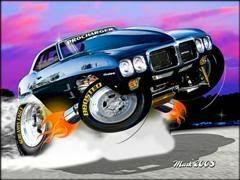 67 Firebird, 3450 lbs., 4 mufflers, 537 ci, 6.11@113 1/8th and 5.60@123 with nitrous shot, street shape. Thats a question for Bad69Bird, believe he ran F2 ended up putting Crank support on. The things they hide, the way they spin things, the excuses that they make and the things they omit. X2 reach out with bad69bird over on PY (sorry Lou) but he selling his crank support right now. I’m sure he will answer all your questions. In all seriousness, I would HIGHLY recommend putting a crank support on sooner than later. There is no slippage on a cog set-up and the tension is greater than serpentine deal (In my experience with mine and my buddy's BBC blow-thru serpentine set-up). IMO, the issue isn't really the amount of boost made, it's how much "pedaling" happens on a pass or if you're going to be driving it on the street. I replaced two crank snouts before I learned my lesson and it cost me far more money than if I would've done this in the first place! Here's the link to the crank support I have for sale. It has all of the details...If you are interested let me know. I am tired of it being in the way and moving it around my shop. lol So the price is negotiable. If you have any questions about it, please feel free to ask or shoot me a PM with your number and I'll give you a call. Thanks! PS. Nice looking car man! Nitrous is like a hot girl with a STD...you want to hit, but you're afraid of the consequences. All times are GMT -3. The time now is 03:25PM.